65 participating countries in this famous event which subject is the architecture, and traces its growth during the last 100 years. -MONDITALIA: 41 projects hosted to the Arsenal draws a portrait of Italy involving cinema, dance, music and theater. The halls will host exhibitions, plays and performances that deals with architecture but also with other riches of our country. The tickets to these shows, unique in its style, can be purchased at the Arsenale or at the Giardini. 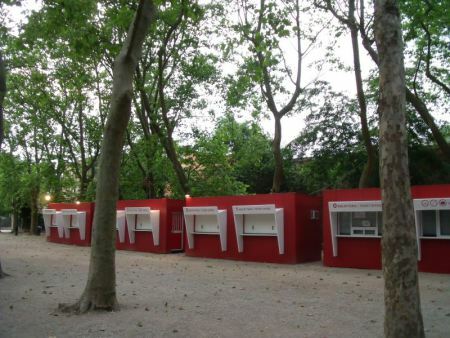 Also this year incumbent supplier of the ticket offices for La Biennale is the company EDIL EUGANEA SRL based in Saletto (PD). The company manufactures metal prefabs with various uses and destinations and this year has provided portable canins that are used during the show as ticket offices and / or information point.